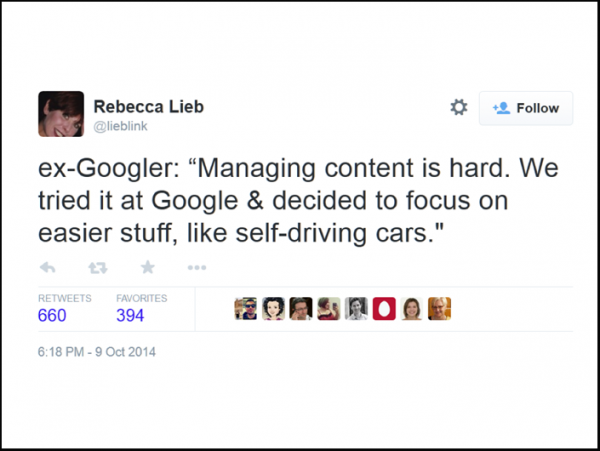 This tweet from Rebecca Lieb, attributed to an “ex-Googler,” was shared by Cleve Gibbon during his keynote talk the first day of this year’s Intelligent Content Conference (ICC) last week. The laughter in the room confirmed that many content pros identify with this summary of the complexity (and frustration) of trying to manage content. This slide in Cleve Gibbon’s ICC keynote presentation set off laughter throughout the audience. Every person I talked with at this year’s event is struggling to keep pace with the amount of content being created at work. Many sessions and hallway conversations touched on this challenge. Good news – and many ideas – came from this year’s event. Of course, we’ll be talking about intelligent content and the complexities of managing all of this in the weeks and months to come on the Intelligent Content blog. For weekly updates, subscribe to our newsletter. For conference highlights, read on. 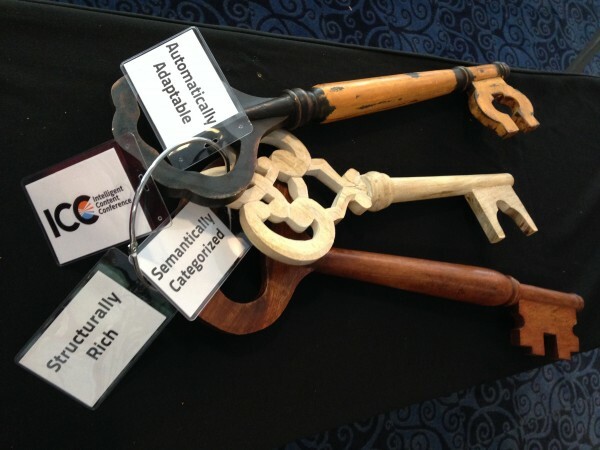 Before I share my top five key takeaways from the Intelligent Content Conference, I would like to acknowledge the literal keys that I was privileged to take away: a set of giant wooden keys that Ann Rockley presented to me onstage as we kicked off Day One. Ann Rockley presenting me with the keys to the Intelligent Content kingdom on the ICC stage as we kicked off Day One. Ann had labeled each key with a large laminated card. (All those years in technical documentation were not wasted on Ann.) She read the labels out loud for the audience: “structurally rich,” “semantically categorized,” “automatically adaptable.” We all recognized these as elements of her well-known definition of intelligent content. What a memorable way to mark the passing of the conference’s ownership from the Rockley Group to the Content Marketing Institute. 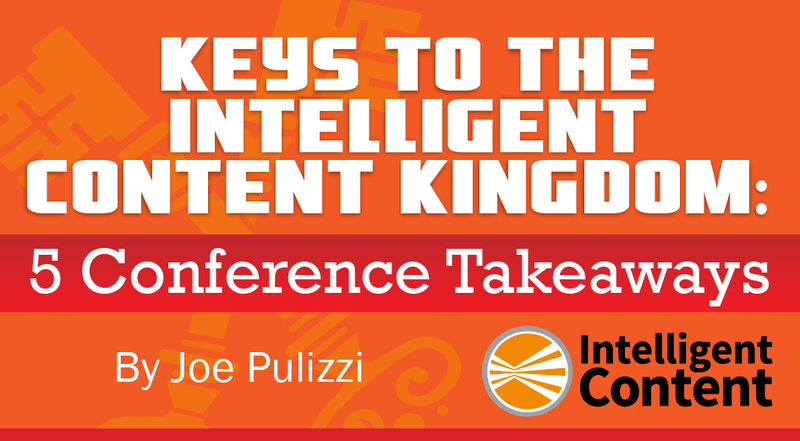 The keys to the Intelligent Content kingdom include these three elements of intelligent content as defined by Ann Rockley: “structurally rich,” “semantically categorized,” “automatically adaptable.” For the complete definition, including three elements not identified here, see What Is Intelligent Content? Treat content as a product, not a project. Work backward from the experience you want customers to have. Structure content – and teams – for intelligent outcomes. Instigate change or follow fast (yes, you!). Let me tell you some of the things I heard that relate to each of these. Product, project: Does it matter which way we think of our content? It sure does. Several presenters, including Cleve Gibbon, stressed that content is a product that needs to be managed throughout its life cycle. It should not be a project that is completed and considered done. In ongoing work with ISITE Design based in Portland, Oregon, Mark and his team are focusing on the most important sections of the site from a revenue point of view and optimizing them based on the ways users are interacting with the content. BMC Software has already seen a 67% increase in marketing-sourced pipeline for BMC.com, and that has paid for the project many times over. “The reason I talk about the continuum approach is that this is an ongoing conversation, an ongoing story-building exercise to help educate people about everything they need to know to make that decision to buy, hopefully from you. It’s about getting your expertise in the room, not about three touches and a sales call. Another key theme that surfaced in many of the sessions relates to customer experience. Scott Abel shared this stat: Three-quarters of brands think they care for customers, but only 36 percent of customers actually feel cared for. Are you providing the kind of experience that makes your customer want to be a part of your brand? And do you do this at every touchpoint: at the right place and right time and on the right device? Cleve Gibbon stressed that we need to start with the experiences we want our customers to have and work backward from that. Content (and technology) decisions flow from that. 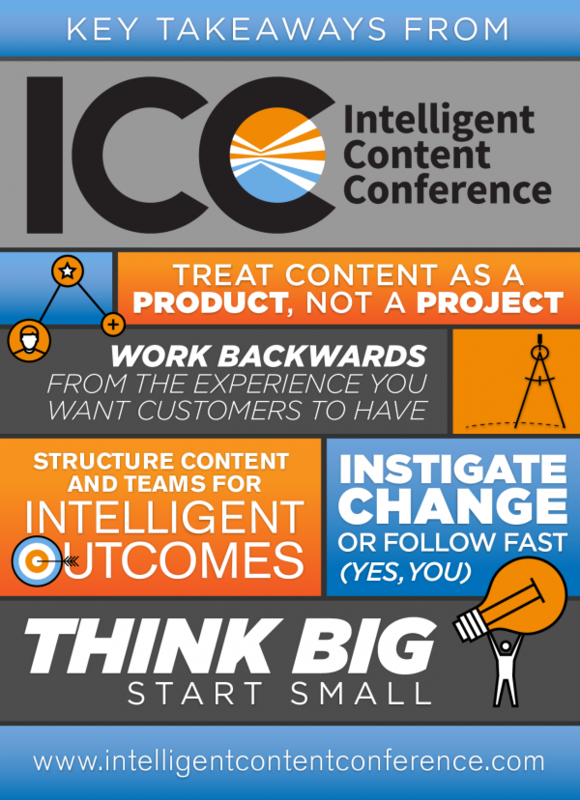 Here are some points from other ICC speakers who reinforced this theme of the importance of customers’ experience of content. If there was one word that rang through the Hyatt at the conference, it would be structure. On the one hand, content needs to be structured. This is a foundational element of the intelligent content definition. In essence, content chunks cannot be tied to any format. As Rahel Bailie mentioned in one of her sessions, only when you have structured, unformatted content can you begin to prepare your content for the future. In fact, the term future-proofing came up several times in the context of structure. It must be raw. It has to be independent of formatting so that it can be used in any number of types of output. It must be self-describing. It needs metadata labels so that computers know what to do with it to serve the business objectives. It must be modular. Each component of the overall structure stands alone so that it can be mixed and matched in various ways. 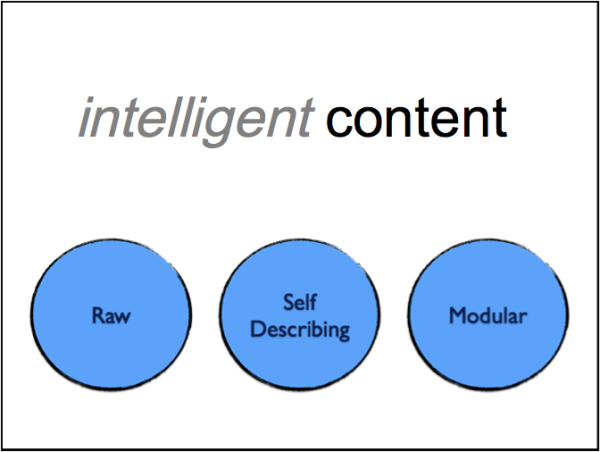 This slide from Cleve’s ICC keynote talk identifies three qualities that structured content must have to qualify as potentially intelligent. It must be raw, self-describing, and modular. Just as content needs to be structured strategically, so, too, do content teams. This question came up a number of times: How are you going to organize people to get all of the work done, especially with challenges and responsibilities that cross departments? If you work for a mid-size or large organization, you have no doubt been frustrated with how tough it can be to make progress. Is too much of your time spent justifying what you need to do instead of doing it? Instigating change is a challenge, but we must take it on. Our organizations depend on us to be change leaders – and first followers. Cleve Gibbon reminded us that we need to get in there and get our hands dirty. Rahel Anne Bailie suggested that we think about the ideal scenario and plan for it in a scaled-back way. Mark Fries and Guy Bourgault talked about focusing on those sections of a website where conversion happens and optimizing them first. This is how they were able to have the biggest impact. Obviously at any conference, the takeaways can’t be summed up in a list of five or even five hundred. Did you attend the Intelligent Content Conference? If so, what were your key takeaways? If not, plan to join us at ICC next year! A thanks to our editorial “ears on the ground”: Marcia Riefer Johnston, Karen Ronning-Hall, Carmen Hill, and Michele Linn.